Keil Software was founded in 1986. Their product range is built around the µVision_IDE development environment with ANSI C/C++ compilers, Macro Assemblers, real-time executives, debuggers and simulators for embedded microcontrollers such as those from the ARM, 8051, 251 and C16x/ST10 families. They are now owned by ARM and are ARMs principle channel for development and distribution of C compilers for the ARM family. Easy to learn and use, RealView MDK-ARM is a complete software development environment for ARM-based microcontrollers. This package is designed for the developer who requires the high performance compilation tools (fast optimised execution and minimum program size) the RealView® compiler was developed by ARM to support their chip family and is now complimented by Keil's sophisticated JTAG debugging support. This is the Windows base Integrated Development Environment that co-ordinates Source Editing, Compiling, Linking and debugging. The Windows based Integrated Development Environment from Keil combines project management, make facilities, source code editing, program debugging, and complete simulation in one powerful environment. The µVision development platform is easy-to-use and it helps you quickly create embedded programs that work. The µVision editor and debugger are integrated in a single application that provides a seamless embedded project development environment. The Debugger supports debugging using your target system and a debugger interface (A ULINK JTAG interface for the ARM; an ICE or serial monitor for the 8051). µVision includes traditional features like simple and complex breakpoints, watch windows, and execution control as well as sophisticated features like trace capture, execution profiler, code coverage, and logic analyzer. The µVision Simulator allows you to debug programs using only your PC with simulation drivers provided by Keil. A good simulation environment, like µVision, does much more than simply simulate the instruction set of a microcontroller — it simulates your entire target system including interrupts, startup code, on-chip peripherals, external signals, and I/O. ARM and Thumb® generation modes: You can mix ARM and Thumb code in the same source file. ARM mode allows for faster code operation making it ideal for interrupt handlers. Thumb mode provides the smallest code size. Industry leading code size optimizations: Enables you achieve memory cost savings by generating the smallest compiled code size. Industry leading code performance optimizations: Reduces power consumption by enabling increased through-put without clock speed increases. Function Attributes for Hardware Support: The RealView C compiler provides function attributes that give you access to ARM hardware features, such as fast interrupt service routines in C.
Embedded Assembler: You may insert assembler code into C function definitions. This capability is necessary for fast DSP and other signal-processing algorithms. The RealView compiler supports full program optimization even when embedded assembler is used. Function In-lining: You may speed-up execution of frequently called functions by using function in-lining. Inline functions are expanded inline without the overhead associated with function call, parameter passing, and return. Parameter Passing in CPU Registers: The RealView compiler automatically uses CPU registers to pass most function arguments. It can even pass and return small C structures in registers. Re-entrant Run-time Library: Most library routines are re-entrant and may be invoked from the main program thread and from interrupts. There is no need to include special protection schemes for library calls. IEEE-754 Compliant Single and Double Precision Floating-point: High accuracy floating-point support. Standard Macro Processor: The macro processor supports assembler macros you may use to repeat or automate assembler instruction sequences. Conditional Assembler Controls: Conditional assembly allows you to control the assembler source code to create multiple target applications from the same source file(s). Source Listing with Symbol Reference: The listing file includes an optional cross reference that provides detailed information about the assembled source file. Detailed Listing File: The linker creates a comprehensive listing file that is easy to understand. It contains details like the memory configuration, input modules, memory map, symbol table, and cross reference. Global Code Listing: The linker generates a global code listing file that shows symbolic disassembly of the generated code. Static Stack Analysis: The linker calculates the stack requirements at link-time. This avoids run-time stack checking in the target application. The CortexM version supports the Cortex M0/0+/1/3/4 range only. The Standard version includes support for most popular ARM variants ...ARM7/9, Cortex M0/0+/1/3/4, R4 & Securecore. The Pro version includes support for most popular ARM variants ...ARM7/9, Cortex M0/0+/1/3/4, R4 & Securecore. It also includes a Real time Kernel and libraries for TCP/IP, USB Device & Host, CAN, GUI and a Flash File System. A real-time kernel for ARM7, ARM9, and Cortex-M3 devices is an option, it allows you to create programs that simultaneously perform multiple functions or tasks. This is often required in an embedded application. While it is certainly possible to create real-time programs without an RTOS (by executing one or more functions or tasks in a loop), there are numerous scheduling, maintenance, and timing issues that an RTOS solves for you. The RTX Real-Time Kernel allows flexible scheduling of system resources like CPU and memory and offers several ways to communicate between tasks. 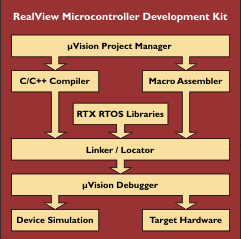 Programs written for the RTX Real-Time Kernel use standard C constructs and are compiled with the RealView Compilation Tools provided in the MDK-ARM Development Kit. Additions to the C language allow you to easily declare task functions without the need for complex stack and variable frame configuration. Real-time programs written using the RTX Real-Time Kernel require only that you include a special header file and link the RTX library into your program. The Keil ULINK USB 2 Interface Adapter connects your PC's USB port to your target hardware (via JTAG, SWD, SWV or OCDS) and allows you to debug embedded programs running on target hardware. Support in µVision is provided for ARM7/9/CORTEX. If you add a small code segment called the Real Time Agent to your application the ULINK2 and µVision IDE can supply a real time window onto memory watch addresses and inter task communications as well as a debugging terminal emulation. Flash Memory Programming is provided with flash programming algorithms supplied for common flash chips or via a user-configurable capability. The Keil Evaluation Kits contain an evaluation board, a 16K code limited version of the RealView MDK-ARM Evaluation Tools, ULINK2 JTAG Debugger and sample applications which run on the CPU. Each evaluation board has a prototyping area and a JTAG Interface. These kits are a great introduction to help you get started writing programs and evaluating the microcontrollers and their capabilities. Keil Software development tools for the 8051 support every level of software developer from the professional applications engineer to the student just learning about embedded software. The industry-standard Keil tools support ALL 8051 derivatives and will help you get your projects completed on schedule. This powerful 8051 macro assembler translates symbolic assembly language mnemonics into relocatable object code where the utmost speed, small code size and hardware control are critical. The debug option provides information to support debugging with the µVision Debugger or an in-circuit emulator. This combines OMF51 object modules and creates executable 8051 programs. It supports common 8051 memory banking strategies (not Dallas 390 or Philips 51MX). Also included are OH51 Object-HEX Converter which creates Intel HEX files from absolute OMF51 object modules and the OC51 Banked Object Converter which creates an absolute object module for each code bank in a banked object module. This is the most popular 8051 C compiler in the world. It provides more features than any other 8051 C compiler available today and language extensions give you full access to all resources in the 8051. The C51 Compiler translates C source files into relocatable object modules which contain full symbolic information for debugging with the µVision Debugger or an in-circuit emulator. Simulation will solve many development problems and a ROM Emulator will speed up your development turnaround time if you are using external memory. An ICE is nice if you can afford one. But if these are not viable then the PK51 package includes a number of monitor programs (for different memory situations) which can provide a limited debug environment. They all work by using the 8051's serial link to connect to the µVision Debugger which can then control downloading of code into the 8051, setting breakpoints reporting variables and running code. The most straightforward of the monitors are MON51 which takes 5KBytes of code space and will only debug code if it can be put into von Neumann mapped RAM space on the target and MON390 which is designed to do the same for Dallas DS80Cxxx boards. FlashMON51 will perform the same functions but can debug code in IAP flash memory and ISD51 will operate with the smallest on chip applications such as the Philips LPC series. The PK51 package includes a number of tools for developing code for the extended 8051 architectures of the Dallas 390, Philips 51MX and Analog Devices ADuC812. AX51 Macro Assembler is an enhanced 8051 assembler that provides support for 8051-based devices with additional instructions and features. It supports the Dallas Contiguous Mode Instruction Set (390/5140/400) and the Philips 51MX Instruction Set. The CX51 C Compiler is an ANSI Standard C Compiler for the Philips 51MX architecture which support linear memory models (8MBytes code and 8MBytes data). The LX51 Enhanced Linker/locator will operate with conventional and extended compilers and supports SROM class for segments that need to be copied from ROM for execution, provides detailed type checking and XDATA constants as well as supporting the enhanced banking capabilities of the 51MX and Dallas chips. Compilers and Debuggers for these CPUs provide similar features to the C51 C Compiler and operate within the same µVision_IDE - call/email CPU specific details.